There have been many ideas presented for the origin of the name "Catboat" - the boats we think of so fondly today. It's the rig, the length to beam ratio, the portlights, the hull design and others - all that epitomize what we call the Catboat. No mention - that I've seen - has been made of the narrow catwalk'ish decks you are almost forced to walk with one foot placed in front of the other - much as a cat does, and only brief mention of the boat's sailing abilities. Cats also have an innate ability to always land on their feet, and catboats certainly sail flatter - and recover - than their sailing counterparts. I was out for a beautiful "winter" sail on the Patuxent River 1 Jan 2006 with only brief "gusts" of wind that registered 3 knots at best. For portions of the sail and for that quiet return up Back Creek to her slip, no wind registered on the water at all - yet she moved ever so quickly and in utter silence, much as a cat stalks its prey in an open field, approaching stealthily yet with the ability to demonstrate quick bursts of speed when all others are resting quietly. Other limited fiberglass production builders followed with similar traditional hulls, including Ted Hermann of Seaford Harbor, Long Island, New York who built the 17’ Hermann Cat in both marconi and gaff rig to a Charles Wittholz design. An updated version is currently available from Cape Code Shipbuilding in Wareham, Massachusetts. Peter Legnos of Groton, Connecticut built the lovely Mystic 20 in both gaff cat and sloop rigs, while Bill Menger of Babylon, New York built a 17’ gaff catboat, later stretched to 19’ due to a shop fire, and also currently offers a Legnos designed 15’ and a Sweisguth designed 23’ cruising cat. In New England, Halsey Herreshoff designed an 18’ 2” fiberglass cat called the Herreshoff America, of which more than 150 were built, while on the West Coast, Fernandes Boatworks in Richmond, CA created the 17’ Molly Cat, with design details adapted to the prevailing wind and sea conditions in San Francisco Bay. In the larger cruising cat category, Mark-O Custom Boats in New Jersey produced the David Martin designed Atlantic City Cat in 21’ and 24’ models. Among smaller designs, Cape Dory for a time produced the Merle Hallet designed 14’ Handy Cat, while the marconi-rigged and Edson Schock designed Strurdee Cat, at 14’ 4” is still being built in Tiverton, Rhode Island. 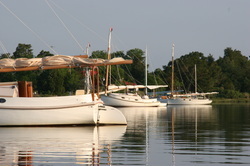 Compass Classic Yachts of South Orleans offers 12’6” and 14’ 2” traditional gaff cats. In wood/epoxy composite construction, Arey’s Pond of South Orleans, Massachusetts offers 12’ 6”,14’ and 16’ models, both with traditional cat rigs. Most recently, less traditional contemporary interpretations are available from the Hutchins Company (Com-Pac Yachts) of Clearwater, Florida with Clark Mills designed 14’ and 17’ models as well as a reincarnated version of the Herreshoff America called the Horizon Cat.